The Color Series are large paintings starting in size of 36" x 36". These were original acrylic paintings on canvas. Following are a few examples. This series is mixed media. Shown here are a few of the collection. The pieces were very three dimensional. It takes several pictures to fully illustrate the art work. Born in the early 70’s the artist witnessed the aftershock of Vietnam, listen to grandpa tell about storming Normandy; he went through the Cold War, and in the early 1990’s, after joining the military, he witnessed friends in Desert Storm, Desert Shield and countless other conflicts still going on. During his early years, the leash was in the hand of people and the collar around the Government. People were thin, smoking was in; yet cancer, allergies, autism… did not exist (small at best). Winning did mean everything, being shamed was appropriate; pride for your country was high; and politically correct speech was yet to be born. Now, armed with knowledge of history, witnessing the present and living days gone by, the artist attest to looming days in our Nations future. He sees the threads of our nation coming apart in view of current events. Our traditions, meager as they may seem, are being challenged by a generation without sustenance, elderly cast away, and the rest lost in a haze of gluttony and perpetual denial. He fears the destruction of our nation from the inside out, as quickly as it first sprung. 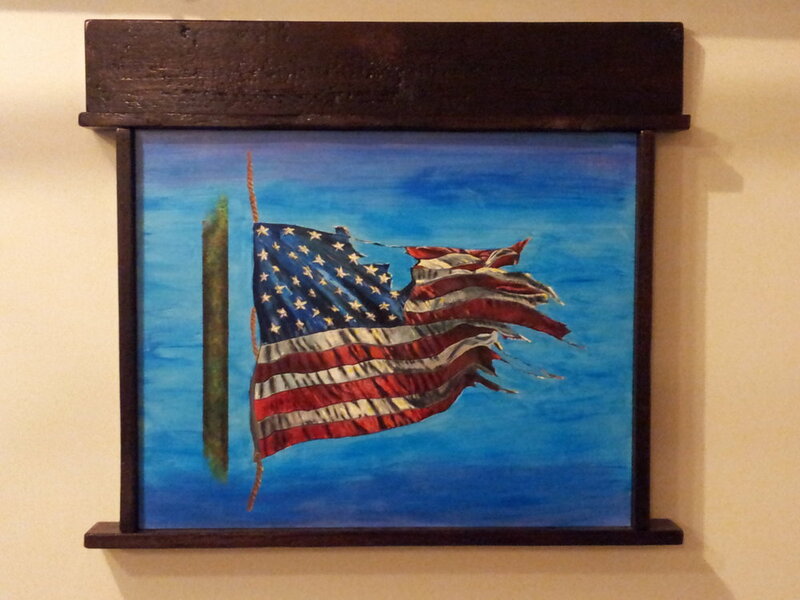 This painting signifies the artist interpretation of our nation’s current status, torn but still flying – what does the future hold. What does the Flag mean to you? The majority of the art above has sold. However, you may contact the artist directly for inquiries.